CAMDEN, ME – January 28, 2016 – Camden National Bank is proud to once again lend its Getting into the Mardi Gras spirit and checking the chute in preparation for the 2016 U.S. National Toboggan Championships support to the upcoming U.S. National Toboggan Championships, this time as a returning Gold Sponsor for the annual event. 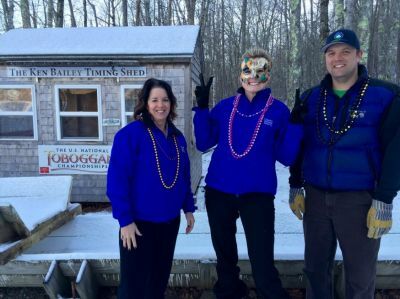 Known as “Maine’s Mardi Gras,” the 2016 Toboggan Championships will take place on Friday, February 5th through Sunday, February 7th at the Camden Snow Bowl, and will feature a Mardi Gras theme to tie into the town’s weeklong Winterfest celebration. Attracting an estimated 6,000 to 8,000 people every year, the U.S. National Toboggan Championships feature three days of winter sports, food and fun. Over 400 teams from New England and across the country come to Camden to compete in this longstanding traditional wooden toboggan race. For more information and a schedule of events, visit http://www.camdensnowbowl.com/. Photo caption: Getting into the Mardi Gras spirit and checking the chute in preparation for the 2016 U.S. National Toboggan Championships. (Pictured left to right) June Parent, executive vice president and senior retail banking officer for Camden National Bank; Jody Landrith, branch manager, Camden Main Office, Camden National Bank; and Andrew Dailey, Toboggan Weekend volunteer.